A civil war is a war in which parties within the same culture, society, or nationality fight against each other for the control of political power. Some civil wars are categorized as revolutions when major societal restructuring is a possible outcome of the conflict. An insurgency, whether successful or not, is likely to be classified as a civil war by historians if organized armies fight conventional battles. While the distinction between a "civil war" and a "revolution" or any other name may be seen as arbitrary, and is determined by usage, the effect of a civil war upon the population is not. Civil wars bring brother into conflict with brother, as people of the same lineage often find themselves on opposite sides, inflicting more than physical damage on each other and their families. Without "parents" to resolve such conflicts the violence continues until a victor emerges. A civil war is "a violent conflict within a country fought by organized groups that aim to take power at the center or in a region, or to change government policies." Everyday usage of the term does not entail a clear threshold for how much violence is necessary to qualify a conflict as a civil war, as opposed to terrorism, or low-level political strife. Scholars use two criteria: the warring groups must be from the same country and fighting for control of the political center or a separatist state, or to force a major change in policy. Their second criterion is that at least 1,000 people must have been killed in total, with at least 100 from each side. Other social scientists, however, consider this casualty number rather low and prefer for instance a definition of an average of 1,000 people killed per year. Ultimately the distinction between a "civil war" and a "revolution" or any other name may be arbitrary, and is determined by usage. However the distinction between a "civil war" and "revolution" can be recognizable. The successful civil war of the 1640s in England which led to the (temporary) overthrow of the monarchy represented by Charles I became known as the English Civil War, however it has also been described, by Marxists in particular, as the "English Revolution." In the United States, the successful insurgency of the 1770s in British colonies in America, which featured organized armies fighting battles, came to be known as the American Revolution. 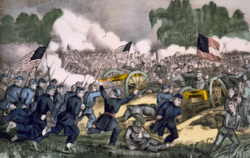 The unsuccessful insurgency of the 1860s by southern U.S. states against the federal government backed by northern states, which also featured organized armies fighting battles, came to be known as the American Civil War. While hostilities were still ongoing, most Confederates preferred to call the conflict the Second American Revolution or something very similar, and had the Confederacy triumphed the war would likely have come to be known as a Revolution and/or a War of Independence. The Final Record of the Diplomatic Conference of Geneva of 1949 (Volume II-B, 121) does not specifically define the term "civil war." It does, however, describe the criteria that separate any act committed by force of arms (anarchy, terrorism, or plain banditry) from those qualifying as "armed conflict not of an international character," which includes civil wars. Among those conditions listed are these four basic requirements. A war between factions of the same country; there are five criteria for international recognition of this status: the contestants must control territory, have a functioning government, enjoy some foreign recognition, have identifiable regular armed forces, and engage in major military operations. NATO does not directly define civil war. However, in the North Atlantic Treaty Organization Glossary of Terms and Definitions (Organisation Du Traite De L'Atlantique Nord Glossaire De Terms Et Definitions), NATO does provide a reference for what is not classified as a civil war. The manual states that "civil disturbance" is defined as "group acts of violence and disorder prejudicial to public law and order." This definition supports the premise shared by the Geneva Convention, ICRC, and the U.S. military that a civil war is a higher level of violence commensurate with that of a conventional war of movement. Almost every nation has minority groups, religious plurality, and ideological divisions, but not all plunge into civil war. Sociologists have long searched for what variables trigger civil wars. In the modern world most civil wars occur in nations that are poor, autocratic, and regionally divided. However, the United States was one of the wealthiest and most democratic countries in the world at the time of its bloody civil war. Competition for resources and wealth within a society is seen as a frequent cause for civil wars, however economic gain is rarely the justification espoused by the participants. Marxist historians stress economic and class factors, arguing that civil wars are caused by imperialist rulers battling each other for greater power, and using tools such as nationalism and religion to delude people into joining them. Research related to the democratic peace theory has studied civil wars and democracy. Research shows that the most democratic and the most authoritarian states have few civil wars and intermediate regimes the most. The probability for a civil war is also increased by political change, regardless whether toward greater democracy or greater autocracy. One study states, "Based on an analysis of the period 1816–1992, we conclude that intermediate regimes are most prone to civil war, even when they have had time to stabilize from a regime change." The fall of communism and the increase in the number of democratic states were accompanied by a sudden and dramatic decline in total warfare, interstate wars, ethnic wars, revolutionary wars, and the number of refugees and displaced persons. Coups d'état are by definition quick blows to the top of a government that do not result in the widespread violence of a civil war. On occasion a failed coup, or one that is only half successful, can precipitate a civil war between factions. These wars often quickly try to pull in larger themes of ideology, nationalism, or religion to try to win supporters among the general population for a conflict that in essence is an intra-elite competition for power. Depending on the definition of civil war used, one can consider purges or genocide to be a kind of civil war on the part of a ruling regime against its populace. These purges are done under the auspices of protecting the regime from espionage or sabotage, but are usually done to stifle dissent or to undercut any popular uprising. Such purges occurred in Russia under Joseph Stalin (the Great Purges), in Iraq against the Kurdish people by the regime of Saddam Hussein (the al-Anfal Campaign), Cambodia under the Khmer Rouge, and the Armenian Genocide in Turkey during the waning years of the Ottoman Empire. Civil wars that are fought over religion have tended to occur more in monotheistic than in polytheistic societies; one explanation is that the latter tend to be more "flexible" in terms of dogma, allowing for some latitude in belief. In Europe through the Middle Ages, the Christianity of the great bulk of the population was influenced by pagan tradition. With the great majority of the population illiterate, access to the Bible was limited and led to a significant amount of syncretism between Christian and pagan elements. With religion so loosely applied, it was rare for people to feel particularly oppressed by it. There were periodic appearances of heresies, such as that of the Albigensians, which led to violence, but historians tend to view these to be the product of peasant revolts rather than themselves motivators of a civil war. As religions tended to become more rigidly defined and understood by their followers, inter-religious tensions generally increased. The rise of Islam witnessed a rash of uprisings against non-Islamic rulers soon after its appearance. Subsequent Islamic history has been marked by repeated civil conflicts, mostly stemming out of the Shi'ite–Sunni divide. In Europe, the Protestant Reformation had a similar effect, sparking years of both civil and international wars of religion. Civil wars between Roman Catholicism and Protestantism consumed France in the Wars of Religion, the Netherlands during the Eighty Years' War, Germany during the Thirty Years' War, and more recently, The Troubles of Northern Ireland. Religious disputes among Protestant sects also played a role in the English Civil War, while official persecution of Catholics during the French Revolution spurred the Revolt in the Vendée. In China, an attempt at religious revolution caused the bloodiest civil war of all time, the Taiping Rebellion. A revolution is generally seen as a civil war fought over issues of ideology, over how power should be organized and distributed, not merely over which individuals hold power. The classic example of a revolution, and by some arguments the first is the French Revolution, which is seen to have pitted the middle class and urban poor of France against the aristocracy and monarchy. Some argue that revolutions are a modern continuation of the peasant revolts of the past. Unlike peasant revolts, however, revolutions are almost always led by members of the educated, but disaffected, middle class who then rally the large mass of the population to their cause. Others see ideology as merely replacing religion as a justification and motivation for violence that is fundamentally caused by socio-economic factors. 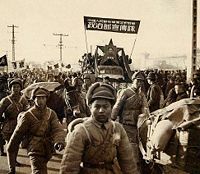 To be successful, revolutions almost always require use of armed force and sometimes escalate to a civil war, such as in the Chinese Civil War. In some cases, such as the French and Russian revolutions the revolutionaries succeed in gaining power through a quick coup or localized uprising, but a civil war results from counterrevolutionary forces organizing to crush the revolution. One of the most common causes of civil wars, especially in the post-Cold War world has been separatist violence. Nationalism can be seen as similar to both a religion and an ideology as a justification for war rather than a root cause of conflict. All modern states attempt to hold a monopoly on internal military force. For separatist civil wars to break out, thus, either the national army must fracture along ethnic, religious, or national lines as happened in Yugoslavia; or more commonly a modern separatist conflict takes the form of asymmetrical warfare with separatists lightly armed and disorganized, but with the support of the local population such groups can be hard to defeat. This is the route taken by most liberation groups in colonies, as well as forces in areas such as Eritrea and Sri Lanka. Regional differences may be enhanced by differing economies, as in the American Civil War. The American Civil War was fought in 1861–1865 between the "Union," a group of 24 Northern states, and the "Confederacy” (Confederate States of America), a collection of 11 Southern states. The Confederacy declared their independence from the United States in 1860–1861. The most commonly cited cause for the war is the issue of slavery, but the conflict was in fact more nuanced. There existed great economic tension as the federal government levied tariffs on imports in order to aid Northern industrialists, forcing Southerners to purchase more expensive domestic goods rather than from abroad. Also, there was a tremendous difference in culture separating the two sides, leading to further animosity. The Salvadoran Civil War was fought between 1980 and 1992 and involved the government of El Salvador against a coalition of leftist and communist forces known as the Farabundo Martí National Liberation Front (FMLN). This coalition challenged the ruling military regime because of poor economic conditions following El Salvador's war with Honduras in 1969. The government also organized death squads targeting members of the opposition. The United States supported the government as a part of American anti-communist policy. The Korean Civil War was fought between 1950 and 1953. The war was the result of the division of the country for use as a buffer zone in the Cold War. The northern half of the peninsula was supported by the Soviet Union, the southern half by the United States. 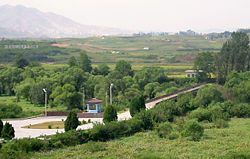 Leaders of both halves wanted to reunite the peninsula under their regime, and in 1950 the North Koreans began attacking in order to do so. The United Nations condemned the attack, and with American aid, the government of South Korea was reestablished and the communist forces driven back to the dividing line of the peninsula, which remains the 38th parallel. The Soviet Union and its allies challenged the United Nations resolution on grounds of illegality since a permanent member of the council (the Soviet Union) was absent from the voting. The North Korean government also did not concur, arguing that the conflict was a civil war, and therefore not clearly within the scope of the UN. While the Americans and the majority of nations regarded this as a valid international intervention, for the Korean people the war had all the characteristics of a civil war. The division of their country following the Second World War had divided families and when the boundary between the two countries closed again after the war in 1953 all hope of reunification of family members was lost for generations. The Russian Civil War took place from 1917–1922. 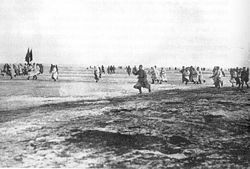 The war involved a number of different factions, but was primarily fought between the communist, Lenin-inspired Bolshevik Red Army and the anti-Bolshevik White Army. The fighting began after the Bolsheviks seized Petrograd (now St. Petersburg) from the rule of Tsar Nicholas II in 1917. The war would lead to the establishment of the Soviet Union and Russia's withdrawal from World War I under the Treaty of Brest-Litovsk. 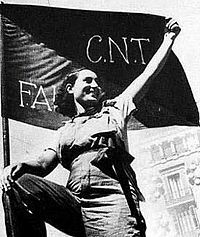 The Spanish Civil War, fought from 1936–1939, was the result of an attempted coup d'état led by General Francisco Franco against the Second Republican Government. Supporters of the government were known as the Republicans and those of Franco known as Nationalists. Franco and the Nationalists fought to preserve traditional Spanish conservatism, which they saw as under attack by the Republicans. Republican reforms such as land redistribution to the poor, scaling back of the military, and anti-clerical actions incensed the Spanish elite. The Soviet Union and Mexico pledged support to the Republicans while the Nationalists counted on the fascist regimes of Nazi Germany and Mussolini's Italy. The war ended in victory for the Nationalists, whose regime only fell upon the death of Franco in 1975. The Vietnam War occurred from 1959 to 1975. The war was fought in name between the communist Viet Cong and South Vietnam, the war can be viewed as part of the Cold War between the United States and the Soviet Union. The United States entered Vietnam in an attempt to aid the French colonial forces there and to fight the growing communist threat. American troop levels in the country rose rapidly in the late 1960s and in terms of pure military force, the United States and South Vietnam had the superior position. The Viet Cong forces, however, enjoyed tremendous support of the native Vietnamese population. The war concluded in 1975 with the fall of the South Vietnamese government in Saigon and the assumption of control by the communist forces under the Democratic Republic of Vietnam. ↑ James Fearon, Iraq's Civil War, Foreign Affairs March/April 2007. Retrieved July 9, 2007. ↑ International Committee of the Red Cross, International Convention (III) relative to the Treatment of Prisoners of War, Geneva, August 12, 1949, International Humanitarian Law - Treaties & Documents. Retrieved July 8, 2007. ↑ Departments of the Army and Air Force, Military Operations in Low Intensity Conflict, FM 100-20/AFP 3-20. Retrieved September 23, 2007. ↑ North Atlantic Treaty Organization, NATO Glossary of Terms and Definitions. Retrieved July 8, 2007. ↑ Håvard Hegre, Tanja Ellington, Scott Gates, and Nils Petter Gleditsch, Toward a Democratic Civil Peace? Democracy, Political Change, and Civil War, 1816–1992, American Political Science Review 95, no. 1 (2001): 33–48. Retrieved November 26, 2007. ↑ Global Conflict Trends, Measuring Systemic Peace, Center for Systemic Peace, 2007. Retrieved November 26, 2007. Kalyvas, Stathis. "'New' and 'Old' Civil Wars: A Valid Distinction?" World Politics 54, no. 1 (2001): 99–118. Licklider, Roy. "The Consequences of Negotiated Settlements in Civil Wars, 1945–1993." American Political Science Review 89, no. 3 (Summer 1995): 681–690. Mack, Andrew. "Civil War: Academic Research and the Policy Community." Journal of Peace Research 39, no. 5 (2002): 515–525. Mason, T. David, and Patrick J. Fett. "How Civil Wars End: A Rational Choice Approach." Journal of Conflict Resolution 40, no. 4 (December 1996): 546–568. Wood, Elisabeth Jean. "Civil Wars: What We Don't Know." Global Governance 9 (2003). What makes a civil war? BBC News article.